← Joanna Pearson. The Rites and Wrongs of Janice Wills. New York: Arthur A. Levine Books, 2011. Chris Cavender. A Pizza to Die for. New York: Kensington Books, 2011. 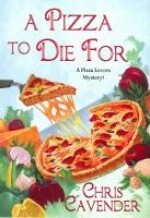 Eleanor Swift loves being the owner of A Slice of Delight, even if the little pizzeria is barely making a profit. Her sister Maddy works with her, her two part-time waiters feel like family, and a steady supply of regulars let her know that her pizza hits the spot. But the commercial district in Timber Ridge is quite small, and when an outsider, Judson Sizemore, decides to open a Food Network-worthy pizzeria a few doors down, Eleanor fears for her business. When someone kills Sizemore just before his restaurant opens, Eleanor should be relieved, but because of a few ill-chosen words that she directed at Sizemore shortly before his death Eleanor instead worries that she is the prime suspect. As was the case in the earlier books in this series, Eleanor doesn’t wait for the sheriff to solve the case. Eleanor and Maddy start their own investigation, drawing on the contacts and skills of their friends, from Paul the baker, to the shady Art Young, to Bob Lemmon, a lawyer who is infatuated with Maddy, to Karen, a regular customer with a variety of useful skills. Their investigation leads them to a wealthy recluse who may or may not have some very greedy relatives. They also uncover a tangle of romantic connections, past and present, reminding the sisters that Timber Ridge really is a very small town! This reader was happy to see that David Quinton, one of Eleanor’s former beaus, is back on the scene–will the next book in the series have one of the sisters sporting an engagement ring?